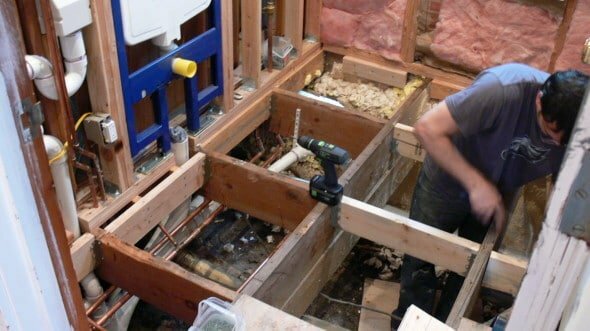 In this first article of our series: How to Build a Shower, we walk through the first two steps of building a high-quality walk in shower; 1) Framing the shower and 2) Installing the supply and drain plumbing for the shower. The building blocks of a custom walk-in shower are simple. You need suitable framing for the walls, ceiling and a shower floor (shower pan) and rough-in supply and drain plumbing. 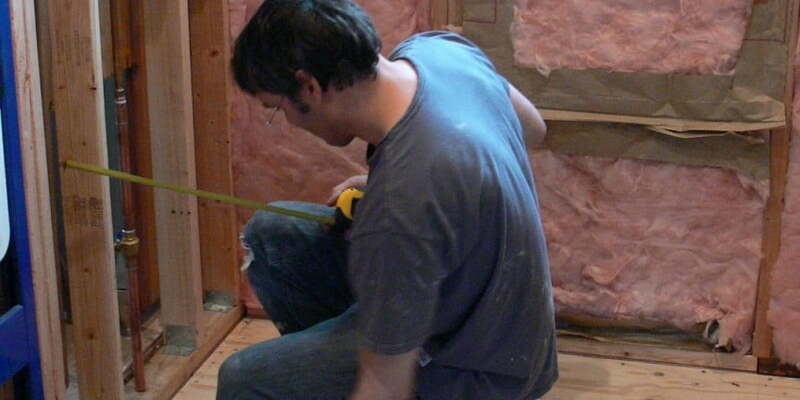 Construction of a built-in shower begins with suitable framing for the walls, ceiling, and floor. If you are remodeling and adding or modifying a shower within an existing bathroom, you may not be able or need to do any work on the wall or floor framing for your shower project. If, however, you have access to the wall and floor framing, use this opportunity to fix any issues with wall and floor structural components. Shower areas, and bathrooms, in general, are wet, humid environments that foster rot and deterioration of floor and wall sheathing and structural framing. Look for it and fix it while you can. Framing prior to rebuilding. Notice wide, irregular stud spacing. Framing under window is wet and rotted. In addition to replacing rotted members, consider reinforcing floor joists and wall framing to provide the necessary stability for tile. Tile finishes, especially on floors, require relatively stiff, flat surfaces that resist deflection with load. Specific recommendations are available from the Ceramic Tile Institute of America. In general, most tile floors will require subfloor deflection of less than 1″ in a 360″ span (L/360). The requirements for natural stone tile are greater. In addition to improving your bathroom’s framing, consider upgrading your subflooring under your planned shower. Subfloor’s that flex too much can crack tile and cause the tile to release from their thin set adhesive beds. The perfect foundation for floor tile is one that is very flat and very stiff — older style 2″ mortar beds are perfect. Wood foundations tend to flex and often require reinforcement prior to laying tile. Ideally, wood subflooring for tile floors should have at least two layers of exterior grade plywood (3/4″ is best) oriented at right angles to the floor joists. Floor joist improvements can also help provide a more stable foundation for floor tile. For this project, I planned to install tile on the bathroom floor in addition to building a new shower and therefore used two layers of 3/4″ plywood. Although not under as much stress as floor tile, wall mounted tiles are also susceptible to excess movement. Walls with too much flex can lead to tile breakage and release, grout disruption, and damage to the waterproofing (especially if paint-on variety). If accessible, wall studs can be reinforced with bracing and metal plates prior to tile backer board installation. If your shower plan necessitates horizontal seams in the tile backer board installation, you may consider installing horizontal blocking between studs to support these seams, especially if using heavy tile. Once you are satisfied with the structural components for your shower build, begin working on the shower plumbing. Your shower requires both hot and cold supply plumbing and drain plumbing. Supply plumbing requirements depend on the type and number of fixtures you plan to include in your new shower and the specifics of the mixing valve you plan to use. Typical showers operate satisfactorily with 1/2″ supply lines. Showers with high flow shower heads or using multiple shower heads may require 3/4″ or great diameter supply lines. Consult the installation documents for the shower mixing valve and fixtures you plan to use. Drain plumbing may already in place prior to your shower build. Often, existing plumbing is inadequate and may benefit from revision. Newer plumbing code requires a 2″ diameter drain pipe, and many older shower and tub drains are only 1 1/2″ diameter. All drains require a trap to prevent the flow of sewer gas into living spaces. 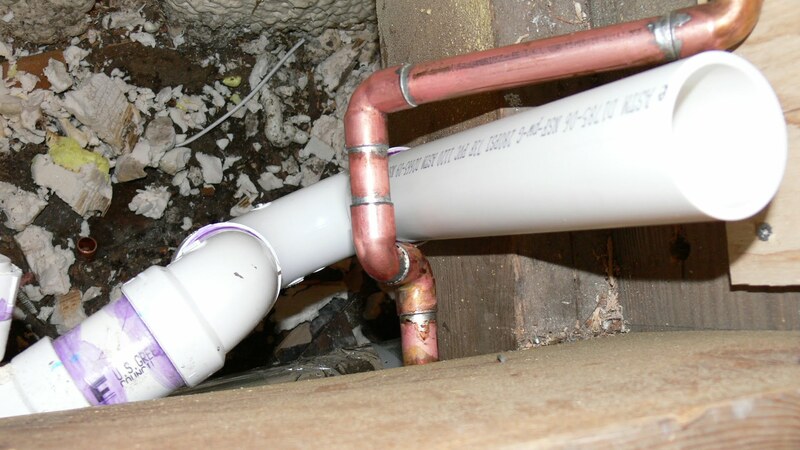 If you are revising your drain plumbing, you may need to incorporate a clean-out fitting into the drain plumbing branch if not already in place. Building a beautiful walk-in shower takes time and effort. The first steps of framing the space and plumbing the shower provide the foundation for a highly functional, durable shower and are important. Invest some time in getting these steps right, and you will enjoy your shower for many years. Below, I outline the steps I took to build a new walk-in shower during our cabin bathroom remodel. The National Standard Plumbing Code. The Plumbing-Heating-Cooling Contractors Association. Tiling Over Plywood Subfloors. Michael Bryne. 3/11/11. The Journal of Light Construction. USG Durock Cement Board Systems. SA932 09305. 6 Ways to Stiffen a Bouncy Floor. Mike Guertin and David Grandpre. Fine Homebuilding184 , pp. 90-95 January 1, 2007. Be sure to consult national and local building and plumbing codes prior to performing any work on your home. 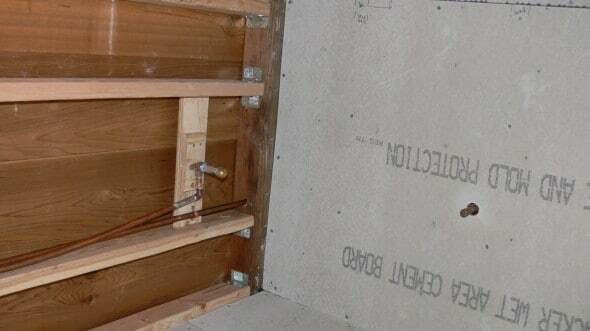 If you are unsure about approved plumbing techniques, consult a plumber to check your work prior to closing walls and floors. 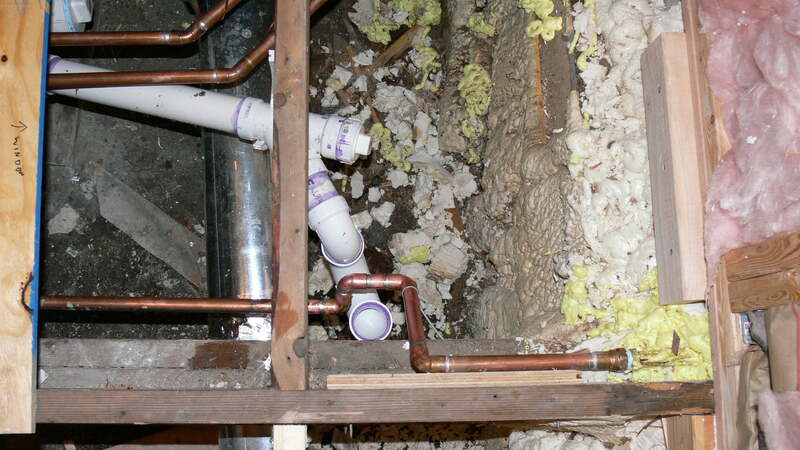 Plumbing errors can lead to very expensive future repairs and potentially dangerous conditions within your home. Demo the existing bathroom structures as needed. For the bathroom remodel and shower build, we removed all of the bathroom fixtures, flooring, finishes and sheathing, leaving only the framing. 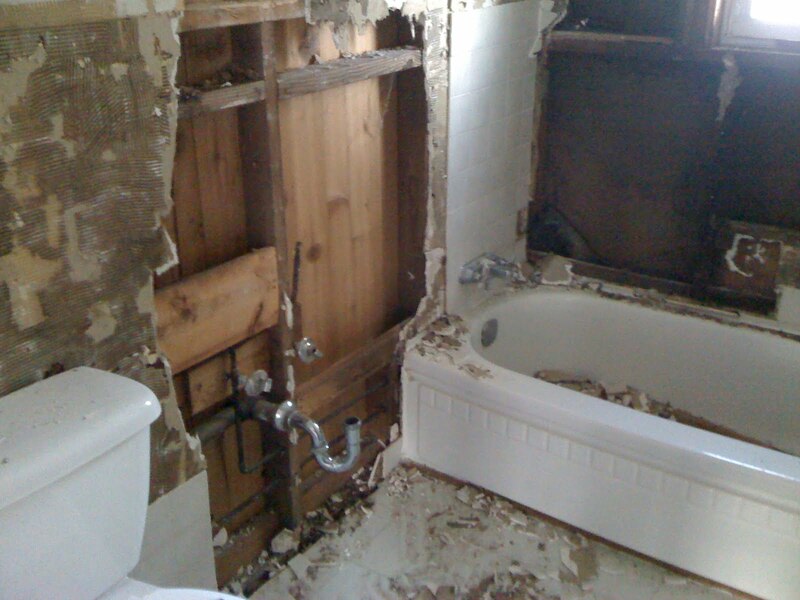 Demolition of old bathroom and shower tile and walls. Notice improper use of gypsum drywall as tile backer board. 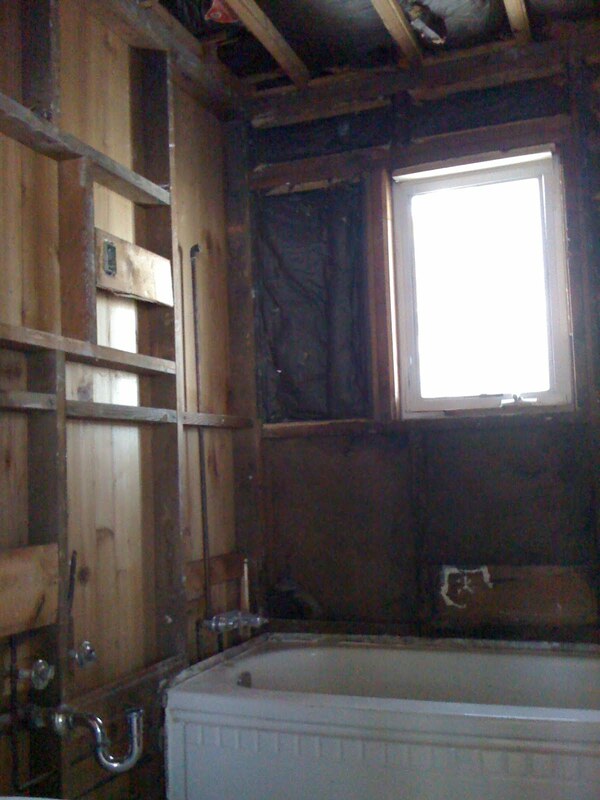 To make room for our full-width walk in shower, we removed the cast iron bathtub. When tearing out the old tile and wall sheathing, we found the tiles to nearly fall off with very little effort. 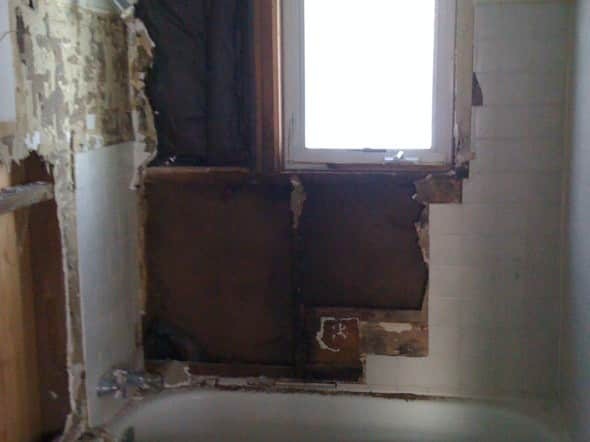 The poor performance of these tiles was likely related to the improper use of standard gypsum wallboard as tile backer for this shower and bathroom space. The use of gypsum drywall (even “green board”) is not acceptable (and not code) and will typically fail when used as a tile backer board in wet locations within 3 – 5 years. Do not use standard drywall or “green” drywall as tile backer! Replace rotted bathroom wall framing. Reinforce wall framing and floor joists. With the walls now open, I replaced all of the rotted framing members, added blocking and reinforced framing connections with galvanized steel angle plates. 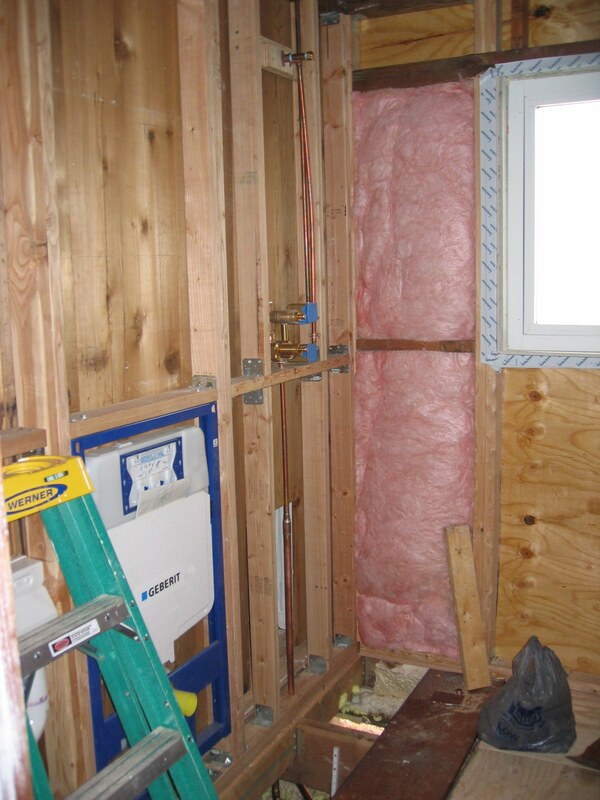 I added insulation to the exterior wall cavities and the interior wall cavities (as sound proofing). Wall studs replaced, blocked horizontally and reinforced with steel angle plates. For the floors, I removed all of the old flooring (linoleum) and old subfloor sheath. Once down to the joists, I added 2 x 6 and 2 x 8 bracing between the joists. To secure the bracing I use joist hangers installed with load-rated screws by Simpson Strong-Tie. Reinforcing floor joists with solid wood blocking. This will help reduce floor deflection and provide stability for the new tile floor. Hand poured mortar shower pans are heavy and should have a solid, stable sub floor base under them. In addition, if you plan to tile your bathroom floor, your tile installation will also require well-supported flooring and a stiff, flat sub floor. My floor joists were well supported and didn’t need much more than some simple blocking between joists. You may not be as lucky and you may need to substantially improve your floor framing and sub floor before proceeding. For more information, see sub floor improvement discussion above. Ideally, wood sub floors should have appropriate joist structure and a stable sub floor base — preferably two layers of exterior grade plywood (3/4″ is best). Specific requirements depend on the type of tile used (natural stone requirements are more stringent) and the specifics of your floor joists including; size, span, and reinforcement of your existing floor joists. The Tile Council of North America publishes specific recommendations based on framing and intended sub floor type – you can read more at the TCNA website. Michael Bryne also has an excellent summary of sub floor construction for tile floors at The Journal of Light Construction. Once the floor joist blocking is complete, sheath the sub-floor with 3/4″ exterior grade plywood. I used a single layer under the shower pan and two layers under the to-be-tiled area of the bathroom floor. 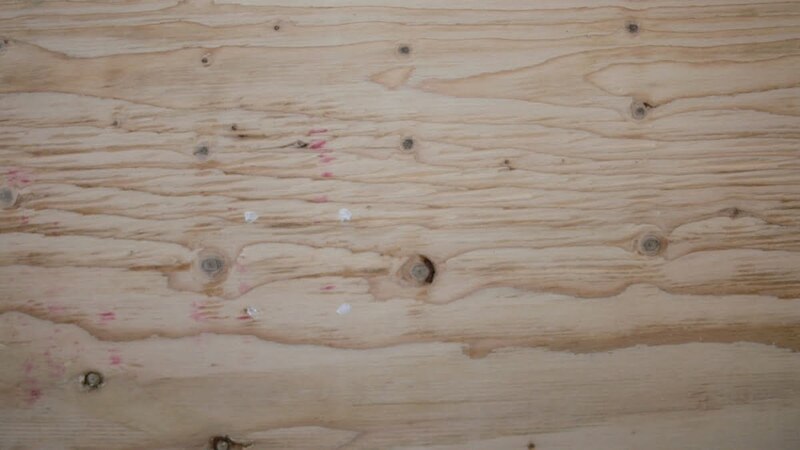 Install the plywood with the grain pattern perpendicular to the joists. 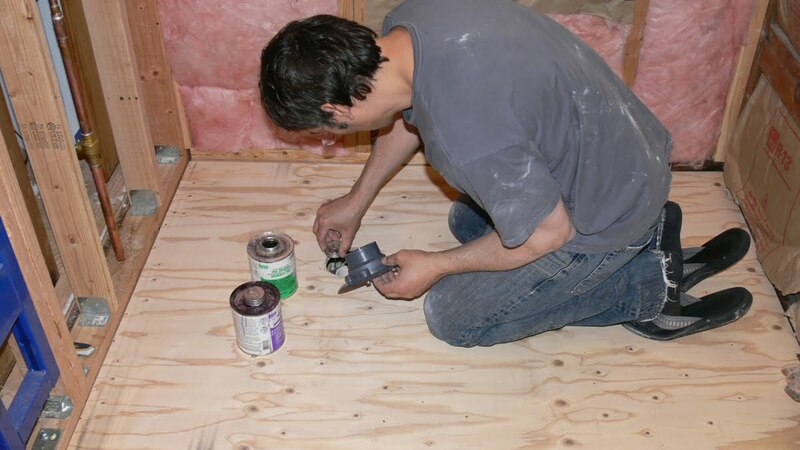 When installing the first layer of plywood, ensure that the plywood joints fall directly over joists or blocking. Screw the first layer of plywood into the joists and blocking at 6″ intervals at the edges and 8″ intervals in the field of each sheet. 3/4″ exterior grade plywood subflooring in bathroom for tile and under shower. Notice grain perpendicular to joists and joints over blocking. 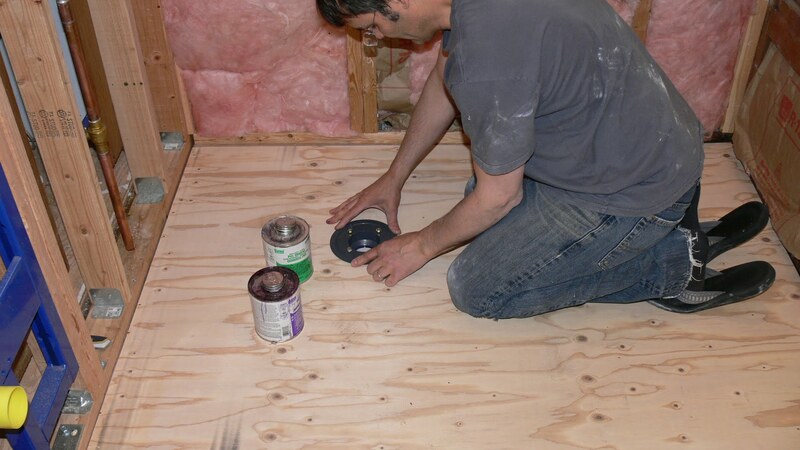 Install the second layer of plywood to offset the seams of the first plywood layer and the joists by at least 2″. Spread a continuous layer of exterior grade construction adhesive between the first and second layer of plywood before fastening. Screw the second sheet of plywood to the first sheet using screws that just penetrate the first sheet of plywood, avoiding the joists and blocking. Screw intervals for the second sheet are the same as the first – 8″ in the field and 6″ at the edge. All of the plywood sheets should have movement gaps between sheets of 1/8″ and at the parameter of 1/4″ to allow for expansion. For the main area of the bathroom floor, in addition to the two sheets of plywood, I added a sheet of cement board as underlayment for the eventual tile floor. This cement board was installed just in the area to be tiled, as the shower area will benefit from a shower pan made up of several inches of concrete floor mix and provide a more than sufficiency tile substrate. I also planned to install an electrical radiant floor heat mat, and the cement board provides an excellent base for this (more on this later). 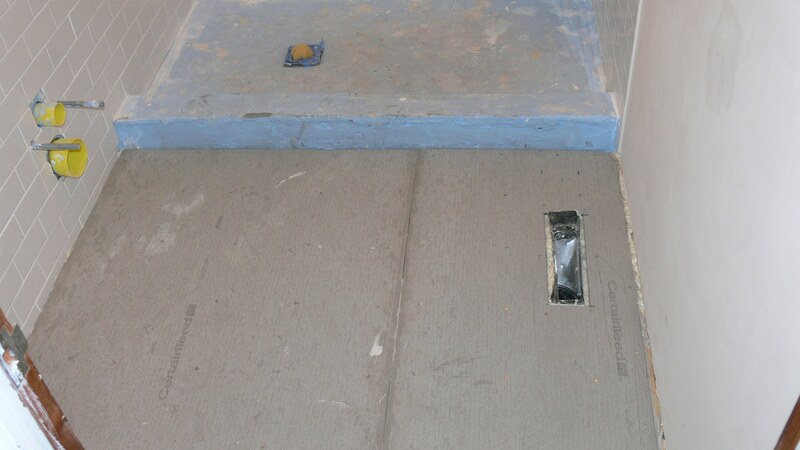 Cement board attached to two layers of 3/4″ exterior grade plywood as the subfloor for bathroom tile floor. To install the cement board over the plywood, first apply a layer of latex-modified thin set to the plywood using a notched trowel. Set the cement board on top of the thinset covered plywood, then fasten with 1 1/4″ cement board screws or 1 1/2″ galvanized roofing nails. 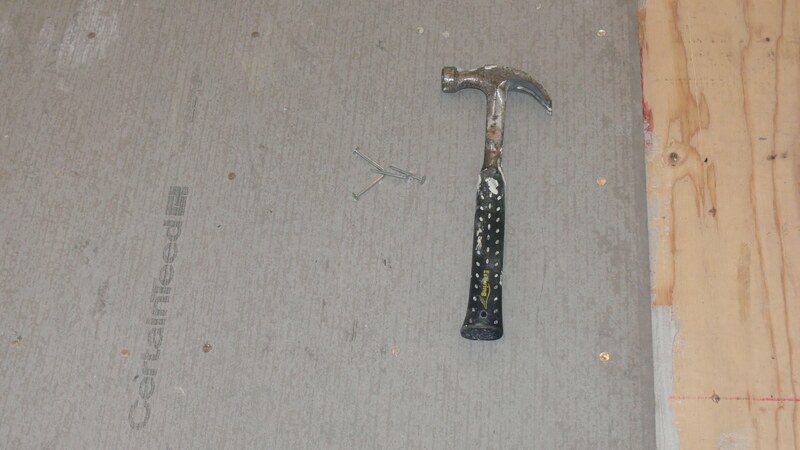 I used aluminum 1 1/2″ roofing nails. As for the thickness of the cement board, you can use 1/4″ or 1/2″ thick board depending on your needs or limitations based on floor height. Cement board underlayment used just over “to-be-tiled” section of the bathroom floor (not used under the shower pan installation — see shower pan installation section for more info). I apologize that this discussion of subflooring and cement board underlayment installation is getting ahead of ourselves, but it server to complete the subfloor installation steps. In reality, I completed the subfloor and cement board installation after I completed the framing and in the wall and under the floor plumbing (supply and drain plumbing). Replace old shower window (if needed). The existing bathroom window was in rough shape. The vinyl covered wood framed window was no match for a humid bathroom and needed to be replaced. 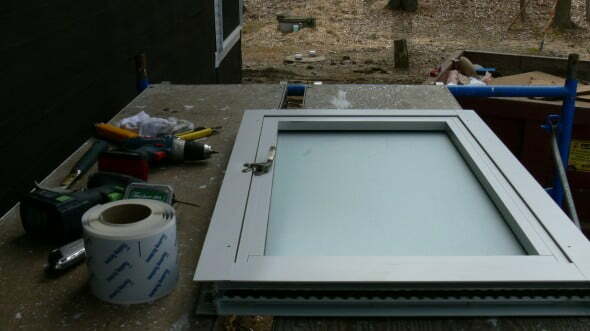 In its place, we used a commercial style aluminum casement window by Kawneer (IsoLock 8225L). The new window is a rot-proof high-performance window that should provide decades of service, even in this challenging environment. Kawneer aluminum frame, thermal-block commercial grade window was chosen as a replacement window for the new bathroom shower. Install supply plumbing and shower mixing valve(s) as needed. Modify existing plumbing as needed for the shower. Previously we had replaced the existing 3/8″ copper supply lines with new 3/4″ copper lines for the bathroom. Our shower mixing valve, however, called for 1/2″ supply lines, so we also need to reduce the new 3/4″ to 1/2″ for the shower. In addition to installing 3/4″ to 1/2″ reducer fittings for both the hot and cold supply lines, I added a shut off valve for each (most fixtures should have shut off valves). To plumb our shower heads, we will need to attach supply circuits from the mixing valve for each of our shower heads (we are planning for both a wall head and a ceiling rain head). Because we were installing two shower heads, we also added individual push-button on-off valves (Toto TS6P push button valves) to allow us to control each shower head individually. Prior to mounting the mixing valve assembly in the wall cavity, assemble as much of mixing valve assembly as possible. Shower mixing valve and shut off valves for wall and ceiling shower head circuits. 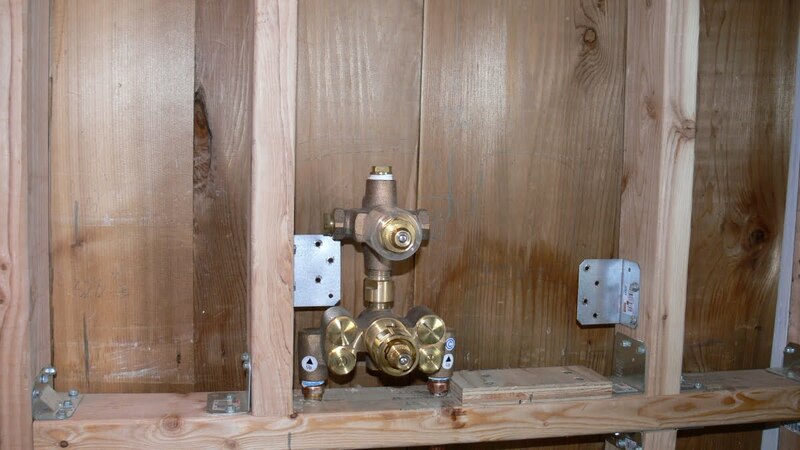 Shower supply plumbing: shut off ball valves and 3/4 to 1/2 reducers. Next, I ran the supply plumbing up from the floor into the wall cavity and attached the shut-off valve and reducer fittings. 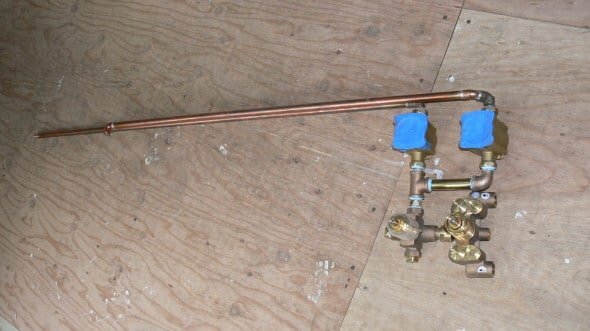 To complete the supply line plumbing, I first soldered the threaded fittings onto the final short copper pipe sections I measured and mentioned above. I then passed them through the holes in the horizontal framing, so the threaded fittings rested above the horizontal framing. Then, after adding several wraps of Teflon tape to the threaded fittings, I turned them into the mixing valve body prior to soldering them to the supply reducer fittings below. Prior to soldering these final supply connections, I made sure the length of the pipe sections between the mixing valve and reducer fittings allowed the attached mixing valve was sitting above and supported by the horizontal framing. Shower mixer and shower head plumbing installed. 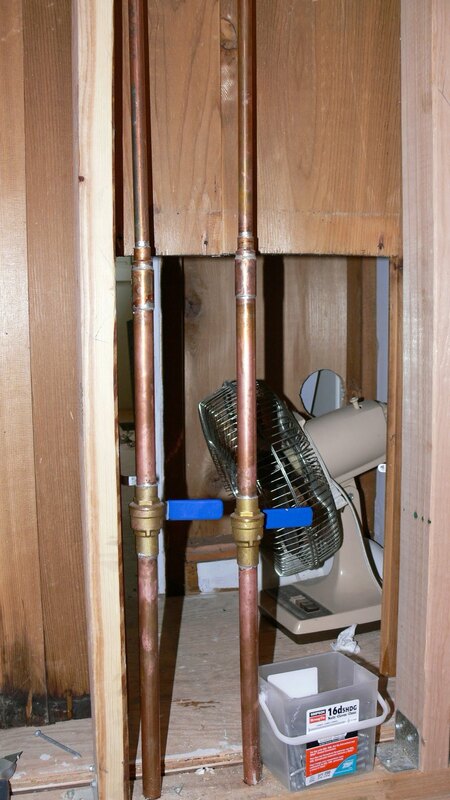 Hot and cold water supply lines connected to the mixing valve just above a horizontal frame member providing excellent support and stability for the mixing valve. Notice the supply lines heading up to the shower head stub-outs. Next, I secured the shower head supply runs to the inside of the wall cavity studs. To help align the shower head supply line with the adjacent stud, I was careful to measure the mixing valve assembly and attached supply lines prior to drilling the supply line holes in the horizontal framing. Once the shower head supply lines were in place, I finished each with a drop ear threaded elbow. Drop ear elbows are rigid 90-degree fittings with “ears” that allow for secure mounting of the elbow to framing and a secure base to connect your shower head arm and shower head. Drop ear elbow connection securely mounted to framing for a stable shower head mount. When installing the drop ear elbow, connect it to the supply line at the desired position of the eventual shower head. Then securely fasten the drop ear elbow to horizontal framing (a block of 2 x 4 or similar mounted between the wall studs). The drop ear elbow has a normal pipe threading (NPT) outlet that will face the interior of the shower and allow for attachment of a shower arm and shower head. The shower arm pipe is the finished pipe that connects to your shower head. Do not install the finish pipe yet. Instead, use a short pipe of threaded 1/2″ pipe that you will not need to worry about while completing the remainder of the shower construction and tiling. Cap this short pipe stub to prevent debris from entering the plumbing and to allow for pressure testing of the circuit prior to closing the walls. Eventually, when the shower walls are complete, you can replace the stub with a finished shower arm, which will connect to your shower head. Copper supply lines for wall and ceiling shower heads. Connect copper supply to drop ear threaded elbows to allow for support. 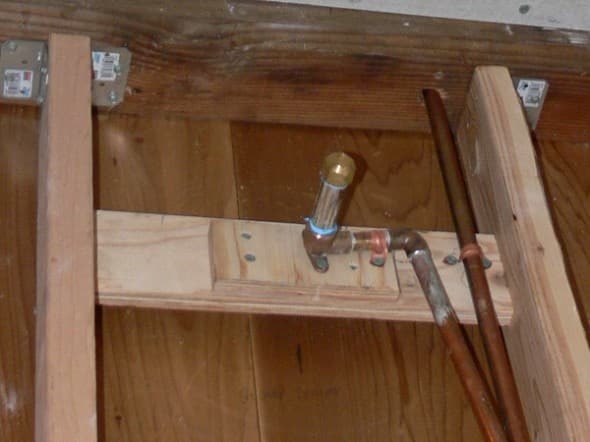 To the drop ear elbow, connect a temporary threaded pipe stub keep debris out and allow for leak testing. With the supply plumbing complete and capped, turn on the water and check for leaks. Shower supply plumbing showing foam insulation. You may also want to remove the threaded pipe cap and run the shower into a bucket to check the function of the mixing valve and to make temperature adjustments of the mixing valve. Many modern anti-scald mixing valves require an adjustment to provide the correct temperature range. Once you are satisfied that the system is working properly, and there are no leaks, turn the water off. If you plan to insulate any of the shower plumbing, do it now. 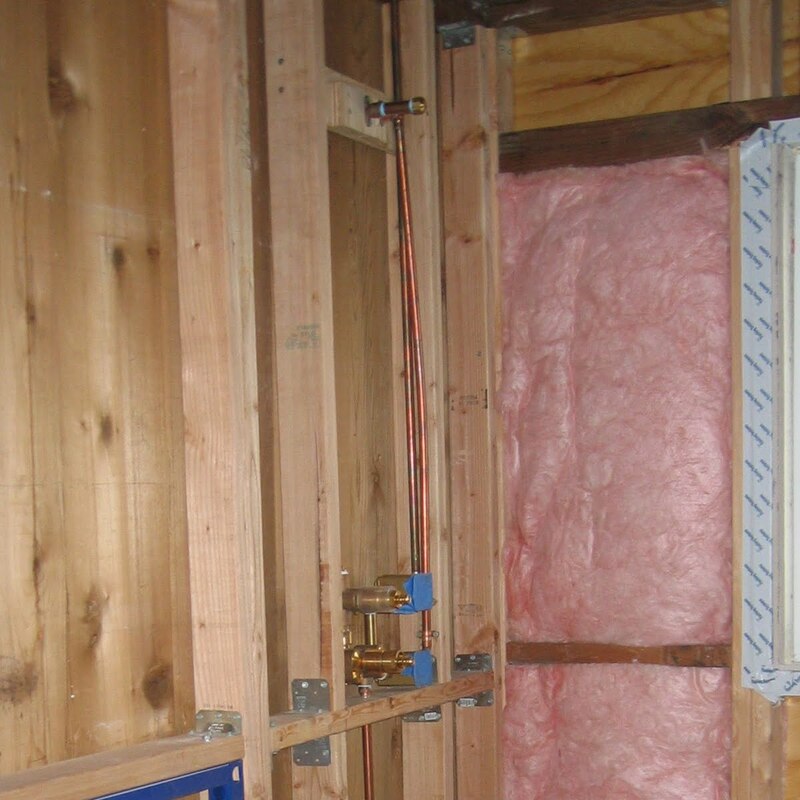 Insulation can save energy, help avoid condensation formation within your walls and quiet the system. Install the shower drain plumbing. Exam the existing drain plumbing and plan for an appropriate shower drain. 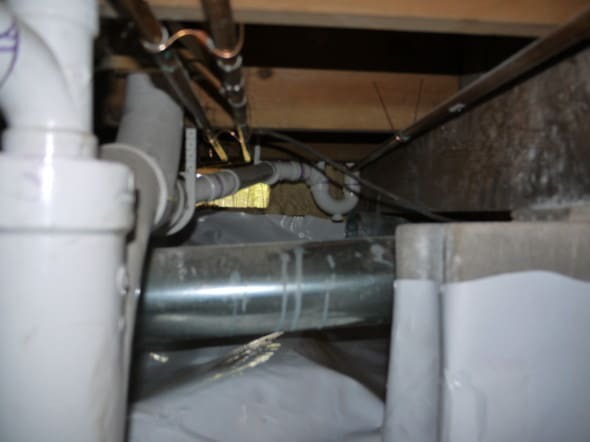 In most cases, building codes will require a 2″ diameter drain line with a P-trap for a shower. The most commonly used drain pipe material is PVC or ABS. Other types of pipe can be used (cast iron, copper, etc) and any pipe labeled “DWV” (“Drain Waste Vent”) is appropriate. When planning your drain run, use drain appropriate long sweep and “sanitary” fittings to reduce turbulent drain flow and help avoid future clogs. Waste circuits require capped clean outs. Clean outs provide pipe access for service if blockage of the circuit occurs and should be located at the end of a waste circuit, close to the fixture the circuit serves. Remember to slope the drain plumbing properly at a rate of 1/4″ per foot for 3″ or smaller diameter pipe and 1/8″ per foot for 4″ or larger pipe. When running your drain circuit be sure to support the pipe runs at least every 4 feet (2 feet is better) with strapping, blocking or commercially available supports. I used plastic, snap-on supports that fit around the pipe and are screwed to the floor joists. PVC shower drain line with sanitary wye fitting. Notice clamp-style support connected to joist, clean-out cap and P-Trap. View of new 2″ shower drain line from below showing P-trap and plastic clamp supports. All drains require a “trap” for each connected fixture. A trap (P-Trap, U-Trap, etc.) 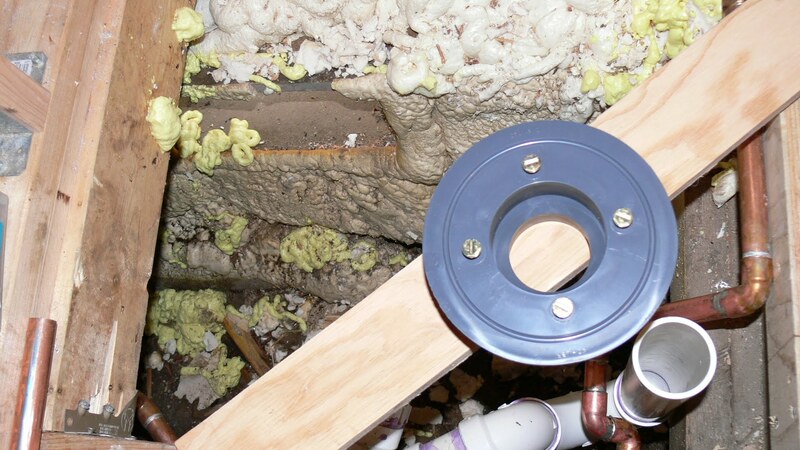 is a semi-circular pipe fitting that “traps” wastewater and provides a liquid seal to prevent the backflow of sewer gas into the living space. Traps are available in a variety of designs. Some provide access to their base to help with clearing blockages or the retrieval of objects lost down drains that often settle at the bottom of the drain trap. For this project, I used a commonly available 2″ PVC P-Trap. 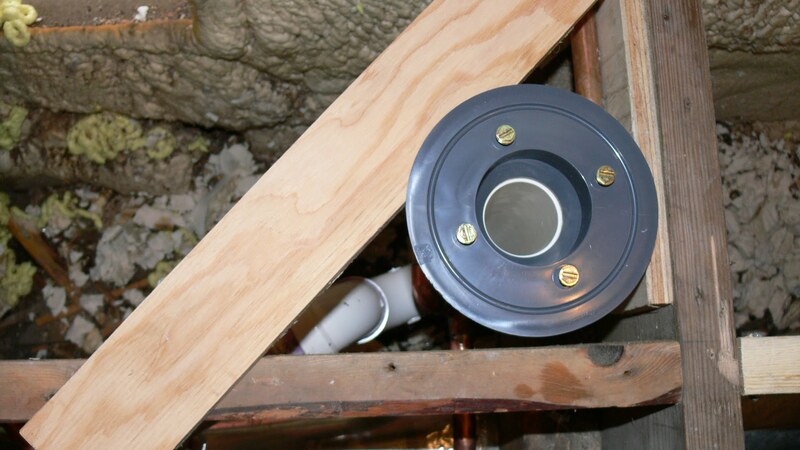 To complete the shower drain circuit, the trap will eventually be connected to a shower drain by way of a vertical run of pipe. When running the drain plumbing, plan the placement of the end opening of the P-Trap location to end up just under the eventual position of the shower drain. Getting the height of the vertical drain pipe to match the drain position of the finished shower will require some measurements and future trimming. For now, just connect a section of vertical pipe from the trap that will exceed the height of the expected drain connection by several inches. 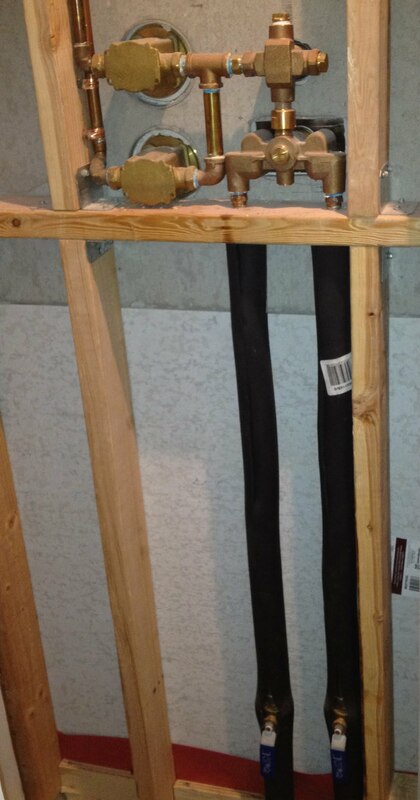 Stub out the shower drain pipe, leaving extra pipe height prior to cutting to length to fit an adjustable shower drain. To determine the correct cut-off point of the pipe, place a strip of the subfloor material you plan to use (In my case a single layer of 3/4″ exterior grade plywood) on the floor joist adjacent to the drain pipe and use it as a guide to determine the eventual position of the drain base once the subfloor is installed. Do this by resting the shoulder of the floor drain base (see image) on the strip of subfloor materials. Slide the floor drain next to the vertical PVC drain pipe and mark the the cutoff point on the pipe. This mark should represent the position of the pipe within the drain base after it is assembled. This position is above the end of the base at the inner shoulder where the installed PVC pipe stops. If you are unsure where to make this cut, err on the side of cutting the pipe too long — you can always cut it shorter. Dry fit shower drain base to rest on a strip of the eventual subfloor material. With the drain pipe marked, cut the pipe to the proper length. As with all PVC connections, use a fine sanding block or similar to smooth the cut edge of the PVC pipe and remove any plastic burrs. Prior to applying PVC primer to the drain base, dry fit the drain base to check length and fit. PVC primer may make it difficult to dry fit PVC – the primer often softens the PVC enough to make it hard to remove parts with primer applied. With the plumbing circuit complete to the subfloor (the shower drain is not installed yet), check for leaks and make any needed repairs now before installing the subfloor. It is also a good idea to double check each joint for evidence of primer and cement application and double check that the clean-out cap is tight and has the proper thread dope or tape applied. Install subfloor sheathing and shower drain base. Now that the drain plumbing complete it is time to install the subfloor and connect the shower drain base. 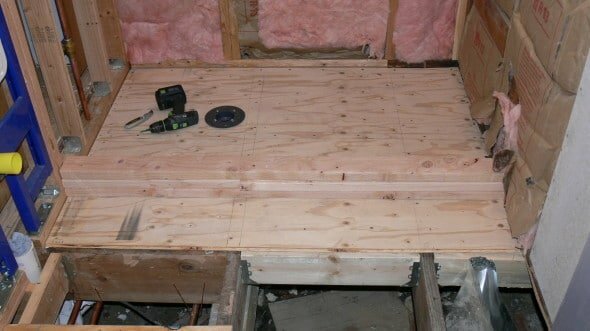 Although I used two layers of 3/4″ exterior plywood for the main bathroom floor subfloor, I used just one layer of 3/4″ exterior plywood for the subfloor under the shower pan. I did this for two reasons; 1)The shower pan will be constructed from several inches of concrete floor mix and will have plenty rigidity without the extra plywood, and 2)Using only one layer of plywood under the shower pan will help decrease the height difference between the shower floor and bathroom floor. Prior to installing the shower subfloor plywood, you will need to cut a hole for the shower drain. Although you can measure to determine the correct spot to cut a hole for the drain base, I like to use a bit of a trick to directly mark the location of the drain on the plywood. The trick is to dry fit the drain base to the drain pipe (do not apply primer to the PVC prior to dry fitting as it may be difficult to separate after priming) and “print” the position of the drain head directly on the plywood. The drain will have screws used to install the top portion of the drain. Install these screws loosely so they are all about the same height. On the heads of these screws dab a bit of pipe dope or plumbers putty. Now lay the plywood over the drain just as you plan to install it. Gently press the plywood down over the drain base to cause the pipe dope on the drain base screw heads to “print” onto the plywood. Lift the plywood up and you should have 4 spots of pipe dope that mark the position of the floor drain. Now, using a hole saw centered on these marks, cut the drain hole in the plywood. Once the hole is cut, drop the plywood down on the floor joist and ensure that the hole is properly aligned with the floor drain pipe (it should be centered). Dabs of white pipe dope on the heads of the drain head will mark the location for the drain hole on the subfloor plywood. Drain base screw head pipe dope marks printed on plywood to mark drain position on subfloor plywood piece. Use drill with hole saw attachment and cut a hole in the plywood at the center of the screw marks. If satisfied with the drain hole and position of the plywood, dry fit the shower drain base to the subfloor. 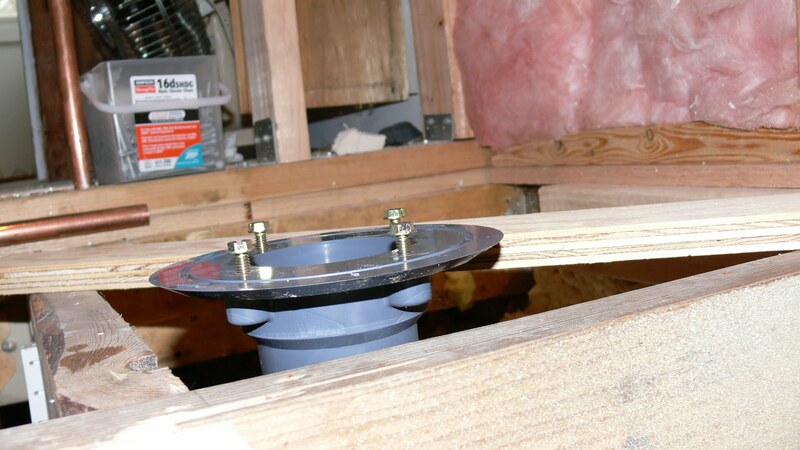 The drain base should slide onto the drain pipe and rest on the plywood when fully seated. Ensure the horizontal drain pipe has sufficient length to pass well into the drain base (ideally, it should just meet the inner end) and provide enough material overlap to produce a reliable seal. If the drain pipe is too long, lift the plywood and trim the pipe. Once satisfied with the drain base fit, fasten the plywood to the floor joists and blocking using exterior grade drywall screws. Space the screws every 6 inches at the parameter and every 8 inches in the field. It helps to mark the position of the floor joists and joist blocking prior to fastening. 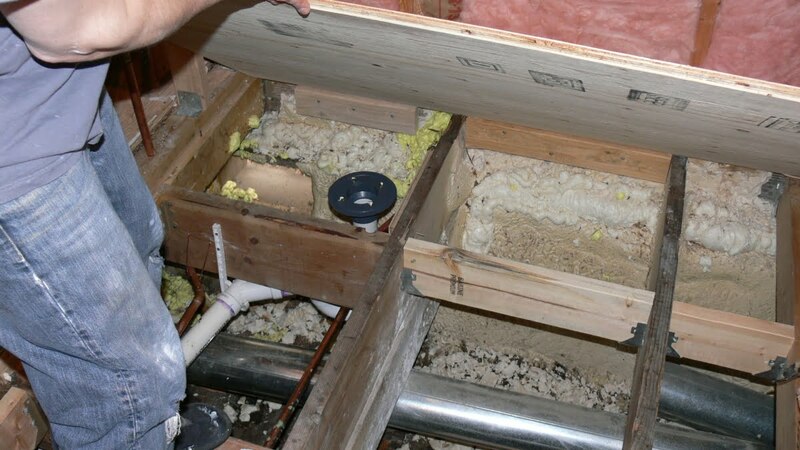 Once the plywood is installed, install the shower drain base to the drain plumbing and solvent weld with appropriate PVC primer and cement. Once satisfied with the drain base fit, use PVC primer then cement to mount shower drain base to shower drain pipe. Shower subfloor plywood screwed down, drain base installed. Once the drain base is install you are now ready to build a shower pan for your shower. 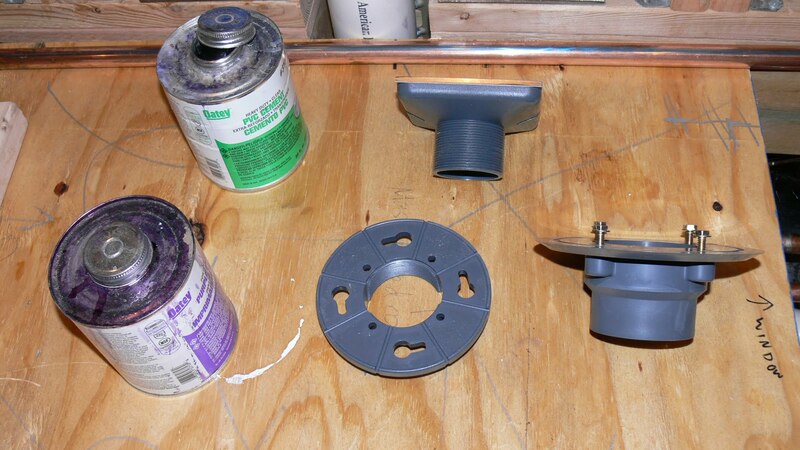 Follow the link below for part 2 of the Build a Shower Series – Creating a shower pan. NEXT: Build shower pan. See Build a Shower Series – Shower Pan. Original bathroom and tub and shower prior to bathroom remodel. Framing prior to rebuilding. Notice irregular, wide stud spacing, water damage and rot. Cement board attached to two layers of 3/4" exterior grade plywood as subfloor for bathroom tile floor. Cement board underlayment used just over the floor area in the bathroom. Kawneer aluminum framed, thermal-block commercial grade window chosen as the replacement window for the new bathroom shower. Shower mixing valve with attached supply plumbing - testing fit mounted in horizontal framing in wall cavity. Shower supply shut off valves for hot and cold circuits. Shower supply plumbing showing shut off ball valves, 3/4 to 1/2 reducers and attachment through frame blocking to mixing valve assembly. Shower supply plumbing showing foam insulation, shut off valves and mixing valve assembly. Shower mixer and shower head plumbing installed. Not drop ear elbow attached to plywood blocking at wall shower head plumbing. Plumbing stubs for wall and ceiling shower heads. Shower drain circuit viewed from below. An adjustable shower pan subfloor drain assembly. Setting up to determine drain pipe height using the floor drain base. 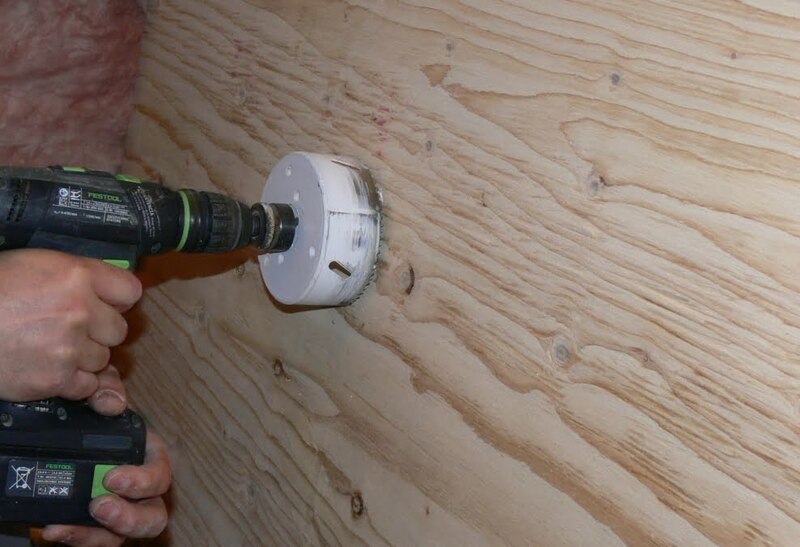 Use drill with hole saw attachment to cut hole in plywood at the center of the screw marks. Primer and cement applied to shower drain pipe and drain base. Once satisfied with fit, use PVC primer then cement to mount shower drain base to shower drain pipe. New 2" PVC shower drain line with sanitary wye fitting with clean out cap and P-trap. Just curious. I see you used angled metal plates instead of toenailing to reinforcing wall framing and floor joists. Is using angled metal plates better than toenailing? BTW, a wonderful site and very educational description of the projects. Thanks for using our site and thanks for the kind words. Using structural connectors (like those pictured from Simpson Strong-Tie) do strengthen framing and help maintain square, sound connections. Many of these connectors where designed to be used in earthquake or hurricane zones. Be sure to use proper fasteners (nails or structural screws) with the plates to ensure performance. Depending on your location, you should be able to find a wide variety of such connectors, angles, etc at most home improvement or hardware stores. Locally, the Home Depot offers products from Simpson Strong-Tie in the lumber area of the store around the area of deck lumber. Thanks so much for your explanation on the usage of the structural connectors and very good pointers on the proper fasteners. I shall keep them in mind. to fasten the angled metal plates for both the wall framing and floor joists? I live in Seattle and get most of my home improvement materials from Home Depot. This has been a great resource or me! I and am about to pour my pan. I just wanted to ask if you beveled the drain opening for the kohler drain so it would sit flush with the subfloor or if you let the flanges simply sit on top. Thanks! Thank you for using the site and thanks for the kind words. You should not bevel the drain hole in the subfloor. The base of the drain should sit above the subfloor (covered with tar paper) slightly to allow the first layer of floor mix to have some thickness at the edge of the drain. The undercut profile of the drain base is intentional to allow the floor mix to pass under the drain base and incorporate the base into this base concrete layer of the pan. Good luck with your project and feel free to post a few images here using the media uploader below. That was extremely helpful! I’m going to mix now – thanks for clearing up that bit, especially with the helpful photo. I had coincidentally bought the same drain before I found your useful DIY. I’ll post some pix tonight- wish me luck! Sorry, a bit late getting back to you. Thanks for the comment and positive feedback. My joists are 2x10s, 16″ OC, spanning about 10′. I believe they’re yellow pine. Based on this deflection calculator [johnbridge.com/vbulletin/deflecto.pl], the joists should be plenty rigid for ceramic tile, and adding blocking can only help. OPTION 1: only one layer of 3/4″ subfloor and 1/2″ cement board would suffice? I’ll also be pouring self-leveling compound to fill in the low spots. I figure with the thinset and tile, my finished floor height shouldn’t be much higher than the adjacent hardwood, whereas another layer of 3/4″ plywood would create problems. OPTION 2: two layers of 3/4″ plywood + a membrane like the one in the JLC article you linked to (no cement board). I presume the membrane would be much thinner than cement board (and wouldn’t necessarily require a bed of thinset), yielding a similar finished floor height to option 1. Is either option a clear favorite? Is there something else I’m not considering? I’d very much appreciate your input. Thanks so much. Thanks for using the site. I don’t recall the exact hole saw size — I believe 4 1/8″ or thereabouts. 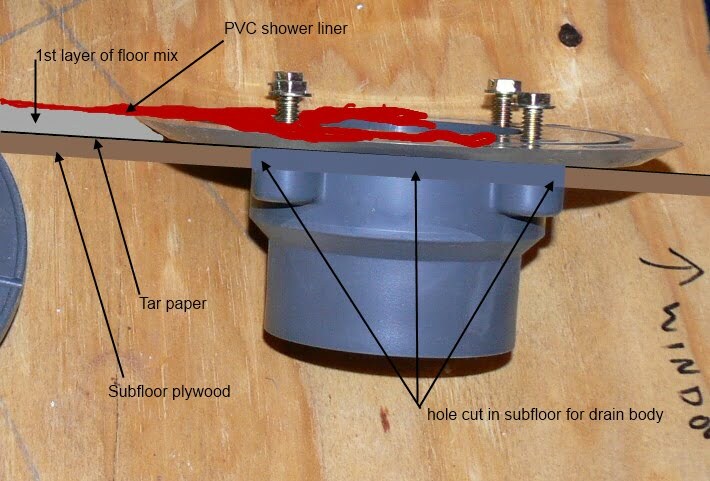 This hole size is not that critical – it just needs to allow the drain assembly to rest on the plywood with the flange on top of the plywood and the drain outlet and collar below the plywood. Thanks for the question. There are many ways to build a shower bench. 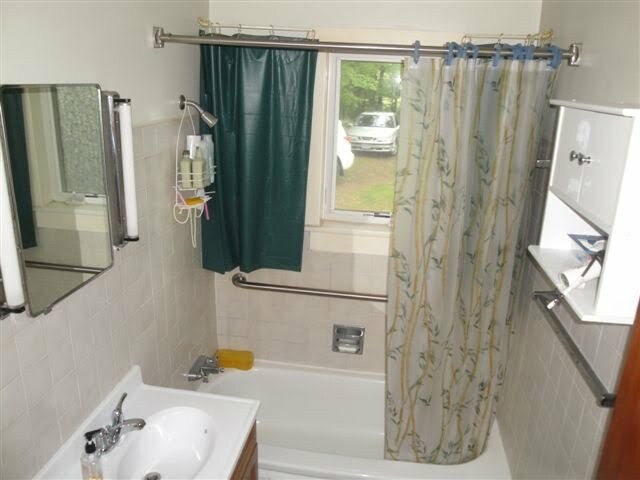 Probably the most common is to frmae the bench with the rest of the shower and cover it with tile backerboard – just like the rest of the shower. Yes, you will need to water proof the substrate of the bench and walls around the bench. The easiest way to waterproof the bench surfaces is with one of the paint-on waterproofing membranes – like Hydroban or Redgard (just google them). Also, the bench surface should be sloped toward the drain to provide water drainage. Here is a link to a good discussion of shower bench construction. As for the shower bench height, I would say anything from 17 – 22 inches. It really depends on the users and what you plan to use the bench for. Higher seats will be easier to get up and down from, but harder to reach your feet from. I would try different heights around the house (toilet, chairs, etc) to find what you think is right. Our shower bench to surface is 21″ from the shower floor. My favorite way to build a shower bench is using the Better-Bench® system by Innovis Corp. This bench is a add-on mortar tray that is easily connected to the shower wall and filled with deck mud before tiling. We have one in our shower and it is awesome! They look like they would not hold much weight, but once filled with mortar they are very strong and rated for 400 lbs. Ours feels very solid. Besides the ease of building a bench with this tray, it offers the huge advantage of not decreasing the footprint of the shower pan – the bench is open below the seat. Enjoy your project and upload some pictures for us to see if you like. Great info! Thanks for putting it out there for dummies like myself. Do you think permabase is a good choice for a backer board? What thickness should I use and does it need a sealer application as well? I used the Toto push button valves to individually control the separate wall mounted and ceiling mounted shower heads. The push button on / off valves allowed me to use one of the shower heads or both at the same time. I should note that the Toto mixer I used was the TSTAR (single volume control) and not the TSTDR (double volume control). The two controls on the Toto TSTAR mixer I used to control the water volume and temperature. My understanding is that if I used the TSTDR (double volume control) mixer, I would have to choose between one output or the other. The reason I used the TSTAR (single volume control) with the two individual push button valves is so that I could use both the wall shower head and the ceiling rain shower head at the same time. In retrospect, the complication of using the two push button valves plus the mixer was probably not worth the trouble. If I was to do it again, I would install the mixer and use a single shower head, or use the double volume control mixer (Toto TSTDR) with the the limitation of only using one shower head at a time if I still wanted to go the two separate shower head route. Reading your article is giving me the urge to start a project! I have a jacuzzi roman bath and stall shower right next to it. They are from the mid 80’s and showing their age. 111 Since I have 2 existing drains – the tub drain is about 8-10 inches from wall and the shower drain is about 17-18 inches. Would like to use the tub shower but suspect shower drain will be more practical and easier to build the pan. pls advise. 222 The bath is on the ground floor and the house is on a concrete slab. Do i put any kind of moisture barrier between slab and the bottom labor of the pan ? Nice article. You should really stress how important it is during rough framing that the shower walls (or entire bathroom is all walls will be tiled), be PLUMB and SQUARE. I’m sure that you did this but it wasn’t discussed. As you know, if the walls are off, then it greatly affects everything that will follow. I’ve seen showers that were done so badly that it caused a LOT of extra tile work to fix afterwards. Any chance you can elaborate on the Toto controls? I am having a hard time finding info for them online. The way yours is setup, the hot and cold come into the mixer, and that knob controls the temp…. that part I get. Your 2 controls on the right are basically on and off switches (1 for shower head, 1 for rain shower) that you can run simultaneously if you wish. That part I get. What I have trouble with is “volume control” knob. If I zoom in on the knob choices available for the TSTAR it seems like the straight up position is closed/off, and the right position is shower flow. Isn’t this technically a “diverter” ??? I don’t see how that is volume control unless the flow is increasing WHILE you’re turning it to the right? If that is correct, then I understand what you did, and I am assuming you plugged/capped the top and left valve outlets or did they come closed? If you chose the TSTDR, you would plug the top outlet, hookup pipe left and right, with one going to head/hand shower, one to rain shower, and then each could be volume controlled AS YOU ARE TURNING the knob towards the symbol (full on) correct? In that setup, you couldnt run both at the same time, but it elimates the need for the push button valves correct? So I would then guess that it makes no difference which side (left or right) you use for rain shower or head shower, at full open they would deliver equal water volume??? Thanks for your time!!!! PS… Did you actually order your stuff of amazon? my tub has a 11/2 drain. when converting to shower would it be adequate size. wall enclosing drain make it impossible to change piping unless I tear complete wall out.